For any of us who have had a loved one hospitalized for any length of time, the stresses of not being able to be at their side can be overwhelming. That feeling is magnified when that loved one is miles or states away. The Nobl Rounding Platform features a friends and family portal, designed to provide quick, secure and real-time updates to family members anywhere with access to the web. The feature also gives family members a chance to share their feedback about the software and the nursing care provided. The portal not only can facilitate family communication, which can impact a patient's experience, but it also saves staff time by eliminating phone calls that interrupt care and distract staff. Improving family communication can impact your hospital's patient satisfaction scores and improve the likelihood that those patients or families will recommend the hospital. 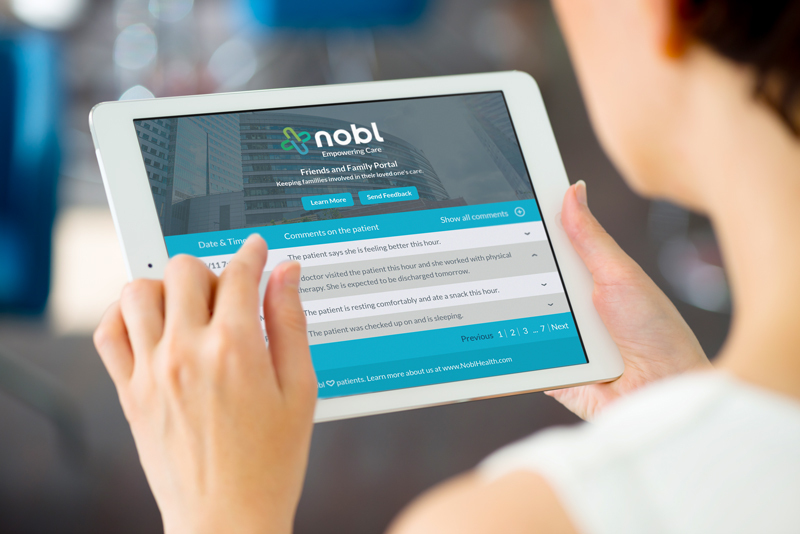 It is just one feature of the Nobl Rounding Platform, all of which is designed and enhanced with direct feedback from actual users. The platform is an ever-changing tool that responds to staff needs, just like the portal responds to family needs. Click here to view a demo of the Friends and Family Portal.